I had to smile at the headline for the Gallery Section “The Crew taking stand up paddling to the next level.” Seems like I may have heard that somewhere else, like this sites mission statement. In any case, I am really glad to see Stand Up Paddling getting this kind of great exposure. I only wish ESPN would have done their homework a little more. They referred to Jamie Mitchell as Chris Bishow, and they misspelled Brandi’s last name (Baksic). I was glad to see Byron Kurt was included , but I wish they would have mentioned his work with the WPA. I think that is just as impressive as his race record, and long term, potentially even more important. All things considered though, It is just good to see our sport and heroes of the sport, getting national attention. Congrats to Jamie Mitchell, Danny Ching, Chuck Patterson, Rob Rojas, Brandi Baksic, Slater Trout, Byron Kurt, Dave Kalama, and Conner Baxter. Getting recognized by ESPN is a great accomplishment, and a testament to your hard work. Kalama’s point is that, with or without the blessing of a snide and cynical mainstream surf culture, the evolution of stand-up paddling has been a group effort, not singularly attributable to one “inventor.” He goes on to credit Hawaiian beach boy John Zapotaky, the great Duke Kahanamoku, Laird Hamilton, as well as the peoples of ancient Polynesia and Peru for the vital roll they’ve all played. Ultimately he contends that as long as he’s getting in the water regularly notoriety matters little. But whether you’re a staunch advocate or a hater of paddles in your pond, what’s undeniable is the sport’s immense reach. In less than ten years since its inception, a SUP world tour’s already into its sophomore season, and has it’s first world champ in young Maui talent Kai Lenny. Plus, given how well competitors recently handled huge Sunset, it’s not just a sport for old men looking to tone their abs. Stroking’s not just something for Baby Boomers, rather there is also a hard-charging, youthful “high performance” element in play too, as evident by what Lenny, and Maui cohorts Slater Trout and Connor Baxter are doing. But it’s the waveless world that has really taken off, and I’m not just talking about the hip new trend of SUP yoga [gag]. Given that there’s a lot more flat water around our country than there is pumping surf, maybe that kind of makes sense. The paddle’s done what wave pools were never able to: bring surfing to the heartland. On bright sunny days paddlers swarm rivers, lakes, inlets, harbors, pools and ponds like broom-wielding locust. 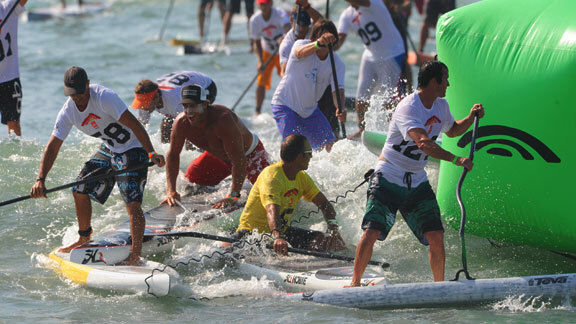 The whole “work out” part of SUPing’s morphed into its own animal, complete with a plethora of respectable events around the U.S. and Hawaii (most notably Rainbow Sandal’s Battle of the Paddle and the Hennessy’s Race Series), its own thriving mini-industry, and a slew of Ironman-like apex predator athletes. Heck, there are even soldiers in Baghdad sweeping the Tigris. Jason Kenworthy Rob Rojoas, the fastest in the open class. All told, the cross section of humans fronting the SUP race scene are considerably more eclectic and diverse than their brethren in the ASP ranks. For little to no financial or career reward, they spend hours on the water blitzing through downwinders and handling arduous cross-chop channel crossings. Among those committed to the cause, a female fighter fighter, a Peahi pioneer, a traditional paddling legend, and an ex-extreme skier. Throw a California Fish and Game Warden and a hot young kid from Maui into the mix, and you’ve got yourself a workin’ man’s paddle royale. The accompanying collection of photos is something that was put together specifically to put some of these guys and girls in context and give a little credit where credit’s due. 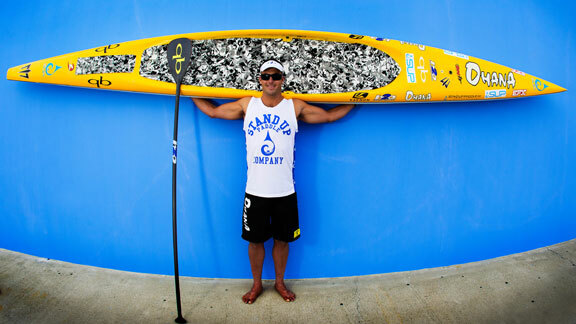 It’s the juxtaposition of competition and camaraderie that’s helped elevate stand-up paddling into a legitimate sport. Because it’s like Kalama concludes, “I might not be ‘the guy,’ but I am the guy that’s on the water as much as anybody, which is good enough for me.” And isn’t that what’s all about in the end anyway? For the rest of the article including the Gallery of our favorite Stand Up Paddlers, go here to the ESPN article.